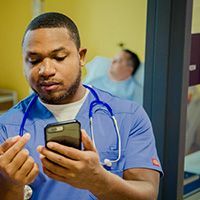 New technologies – virtual simulation, adaptive learning, and mobile apps – have the potential to advance healthcare programs, producing nurses and physicians better prepared to meet industry challenges. What’s needed to achieve the promise? Industry trailblazers. Nurse educators are leading the charge when it comes to adopting new technologies. A 2017 Wolters Kluwer survey found a significant increase of new technologies used in nursing education, including 65% of programs using visual simulation and nearly half expected to use virtual reality within five years. The increased use of new technologies in education comes in response to a shortage of clinical trial sites and demonstrates a progressive approach to meeting the demand for practice-ready nurses – prepared not just to pass board exams, but also to deliver hands-on patient care. Across the world, healthcare practice is becoming more technology driven. Digital learning is growing in popularity and with it, new and creative ways to engage students in acquiring, managing and using knowledge. It turns out that nurse educators are adopting new technologies faster than those in general education. For example, adaptive quizzing models have been found to improve learning and retention of course content, according to a 2016 paper in the journal Nurse Educator. The high use in nursing education makes sense given the growing importance of technology in healthcare settings from Electronic Health Records (EHRs) to monitors, drug dispensers, and hands-free communications used throughout the day. Programs designed to prepare the nursing workforce have a clear goal in sight: improved outcomes. In the next five years, it’s expected that innovative solutions will play a bigger role in nursing programs, including virtual reality for skills development, mobile app use, and, although at a slower pace, analytics tools. The real advantage of advanced technologies and digital solutions is the instant knowledge they convey to healthcare professionals, when and where the knowledge is needed. With nurses on the front line of patient care, rapid access to trusted medical content, current recommendations, insights and expertise in using technologies is all the more critical. Check out our infographic, which profiles the technologies that nursing education programs are adopting. From inadequate coordination between clinicians to misaligned incentives and care discrepancies on a global scale, reimagining the patient experience to achieve better outcomes – at lower costs – has become a critical area. The juggling act between cost and outcomes is best illustrated in the context of Medicare’s Hospital Value-Based Purchasing (VBP) program, which rewards higher-performing hospitals with incentive payments and penalizes.